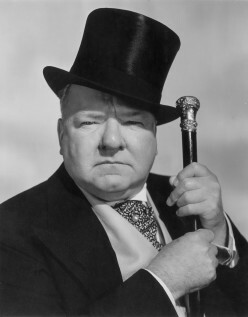 Born William Claude Dukenfield in 1883, WC Fields was one of the most popular comedians of the 1930's. His rotund physique, irascible visage, drawling, elongated voice and cynical, wisecracking personality was irresistable to depression-era filmgoers, looking for relief and a temporary escape from the harsh conditions of the time. Such quips came as easily to Fields as quacks to a duck, even though in reality Fields drank only later in his career and if his many relationships were anything to go by, he was very fond of women. Audiences found him hilarious, not merely because of the witty lines but also because his delivery was so distinctively original. Fields had created a unique persona..a misanthropist that was at the same time, funny, deeply lovable and enduring. He was charming to work with, his suggestions and adlibs were always in character. There was a scene in which he had to sit at a desk writing, and he asked me if he could have a cup of tea on the desk. When he got agitated, he dipped his pen into the teacup instead of the inkwell. Another time he was sitting on a high stool and asked for a wastepaper basket so he could get his feet stuck in it. Physically he wasn’t quite right, wasn’t bald as Dickens describes Micawber — but his spirit was perfect. In amongst his film, theatre and radio work, Fields also managed to write and reputedly he rejected the title role in The Wizard of Oz in order to finish his screenplay, You Can't Cheat an Honest Man. In addition to his writing and comedic skills he was also known widely as a gambler, pool hustler and infamous card-shark. 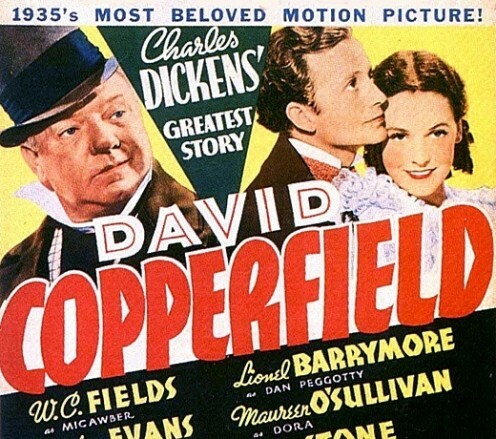 WC Fields did a sterling job as Mr Macwber in the 1935 George Cukor classic. Another of Field's more famous films was Edward F Kiine's, My Little Chikadee,where he teamed up with the equally unique Mae West. The pairing of Field's as Cuthbert J Twllie to West's Flower Belle Lee proved to be comedy gold as the wisecracks went back and forth like a fast ball at a tennis match. West's sexually loaded, double entendre was the perfect foil for the razor-witted Fields and vice versa. Twillie: May I present my card? Belle: 'Novelties and Notions.' What kind of notions you got? Twillie: You'd be surprised. Some are old, some are new. Whom have I the honor of addressing, m'lady? Belle: Mmm, they call me Flower Belle. Twilie: Flower Belle, what a euphonious appellation. Easy on the ears and a banquet for the eyes. Belle: You're kinda cute yourself. Twillie: Thank you. I never argue with a lady. Fields could entertain without opening his mouth - he was an accomplished juggler and in fact began his career under the banner The Eccentric Juggler, playing Broadway, theatres and music halls all over the US and Europe, . As he progressed as a performer, he included many asides and jokes into his act, expanding his repetoire until the wisecracking persona overshadowed the juggling. By the end of his illustrious career, he had managed to become one richest and most influential comics of the twentieth century. Fields was a bonhomie with a fondness for food and drink and although it took him a while to become a serious drinker, in the end it did catch up with him and he died in 1946 from an alcohol related stomach complaint.. Many of his contemporaries describe a 'kind and gentle man' who at heart, longed for the kind of happy family life he himself had enjoyed as a child. Famously, he once said he could 'only sleep when it rained' and on the eve of his death, his partner Carlotta Monti pointed a hose on the roof of the sanitarium where he lay dying so he go listening to the soothing sound of the rainful he loved. Unusually for his day, Fields was an avowed atheist and in his final weeks in hospital, a visiting friend recalled that he arrived to see Fields reading a Bible in his hospital bed. When asked why, he replied, "I'm checking for loopholes."